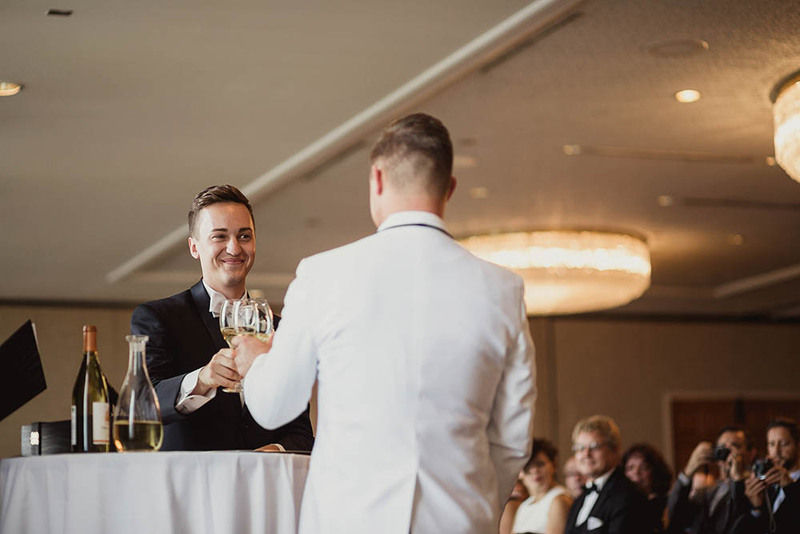 Chic black and white tuxes, Art Deco details, and the sweetest grooms you’ve ever seen are just a few of our favorite things in Jacob and Mitch’s Chicago wedding. The Mid America Club provided an elegant venue for the celebration where Jacob and Mitch were joined by loved ones who dressed to the nines for the affair. Shaun Menary photographed the glamour and romance impeccably, and these images couldn’t have more perfectly captured Jacob and Mitch’s vision for their big day. Our wedding was inspired by a classic, timeless, Art Deco look. Some may say Great Gatsby themed. We wanted an elegance like we hadn’t ever seen. My favorite moment from the wedding, if there was just one, was the “I do” moment. Things just finally clicked and felt amazing, we were surrounded by everyone we love and cherish and just felt like the luckiest men alive! We had a blessing of our wine box, during our ceremony that everyone held a major role in. This was one of our favorite moments that included everyone. There were so many moments that were amazing, it was the best day of our life’s! Photographers were absolutely amazing! Worth every dime. They captured the amazing moments and told a story with every picture. Fireworks against the Chicago night sky couldn’t have been a more perfect way to end the night! If you loved Shaun Menary‘s photography in Jacob and Mitch’s wedding, be sure to check out Lauren and Jason’s classic and chic wedding at The Room on Main. These photography are looking very nice and wonderful . So thanks a lot for sharing these with nus. Photographer captured skill and perfect photography . Always i’m admire you photograph .